In 1893 the cornerstone of St Jude’s was laid by Rev. Thomas Macheau, acting for the Bishop of Michigan. The new church had been erected at a cost of $6,500. The history books tell us that, after the laying of the cornerstone, “an elaborate dinner was served by St Jude’s Guild at the Fireman’s Hall for 25 cents a plate.” The new church was open for services on March 11, 1894 and was consecrated by the Bishop in April 1894. Before the new church was erected, meeting were held in various homes, over downtown stores, in churches of other denominations, or in the local Roberts House hotel. In 1859, St Jude’s Church of Fenton was incorporated and services were conducted by clergyman who were on their way to various other towns that were also in need of their ministry. The first time the choir sang was on Sunday, May 26, 1895, under the direction of Miss Flora Davis. The choir consisted of 4 men and 14 boys. It was not until Miss Davis left that women and girls were allowed to sing in the choir. The ivy that grows on the north side of the church was brought to St Jude’s from a cathedral in England by Rev. Reasoner during his time here as rector. The ivy is a nice bond between St Jude’s and the Church of England. In 1922 it was decided by the vestry that St Jude’s was not financially able to have a rectory and that we would have t operate the church under a non-resident because of poor economic times. The vestry was increased from 7 members to 12 in 1924. The pledges that year totaled $2,334, and it was decided to purchase a rectory. It was agreed that, on a 50/50 basis, with the parish and the diocese each paying, we purchased the property on W. Shiawassee Ave., for $6,000. The new rector, Rev. L.P. Haggar, now had a rectory to live in. In August 1938, he was called to be the Archdeacon of the Diocese. Also in 1938, more classrooms were needed for Sunday School, as well as activity areas, so the basement of the church was remodeled adding classrooms, a small kitchenette and lavatories. 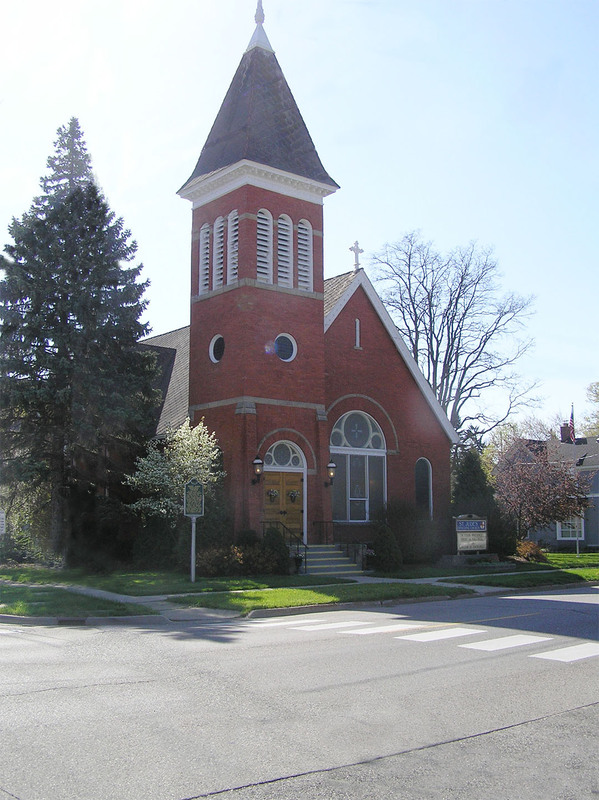 In 1953, there was an expansion drive and the rectory on W. Shiawassee Ave., was exchanged for property on E. Elizabeth St., adjacent to the church. It was to be used as a Parish House, office space and church school. In 1958, the house just south of the church on S. Leroy St. was purchased for a rectory and 2 houses and land on Oak St., south of the Parish House, were purchased. This area later became the parking lot. The rectory on S. Leroy St. was first occupied by Rev. David Covell and his family. In the early 1960’s, the Parish House had become too small for our needs, more plans were made to construct a new Parish House, our present Vandenbergh Hall. It was dedicated by Bishop Emrich on Oct. 9, 1966. The mortgage was burned at the 10:30 service on June 13, 1976. In about 1978, it was decided by the vestry to no longer bear the expenses of owning a rectory, but rather to give the rector a housing allowance. 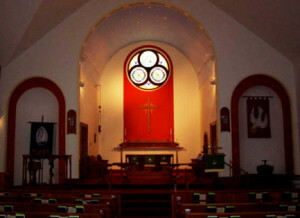 In 1979, the interior of the church was re-painted and the beams and altar, which had been painted white in 1951, were restored to their natural oak. The altar was moved forward from the wall, so that it was free-standing, allowing the priest to face the congregation in preparing for communion. The property next to Vandenbergh Hall, which had earlier been reserved for a parking lot, was paved and lighted in 1985. A split rail fence was added later and a handicap ramp was also built. This area was later renovated to accommodate the Memorial Garden. St Jude’s continued to grow with our next rector, Elizabeth Morris Downie’s coming in 1993. On Sept. 11, 1994, the Fest of the Holy Cross was celebrated during the dedication of the new cross. Shelves were installed along the bank under the new cross. The program, “Journey to Adulthood” was started. This program encourages youth (both Junior and Senior) to develop their own path to an adult faith. Rev. Downie retired from St Jude’s in 2003. The Rev. Walter Sherman and Rev. Leslie Harding filled in as supply priests while the parish looked for a new rector. In 2005, we called the Rev. Joshua A. Hoover to be our current rector. He was welcomed along with his wife Allie and their children, William and Julia. In January, 2015, the Hoovers accepted the call to another church. The Reverend Heather Barta was our interim Rector until April 2016, when The Reverend Tracie L. Little was announced as our new full time Rector.